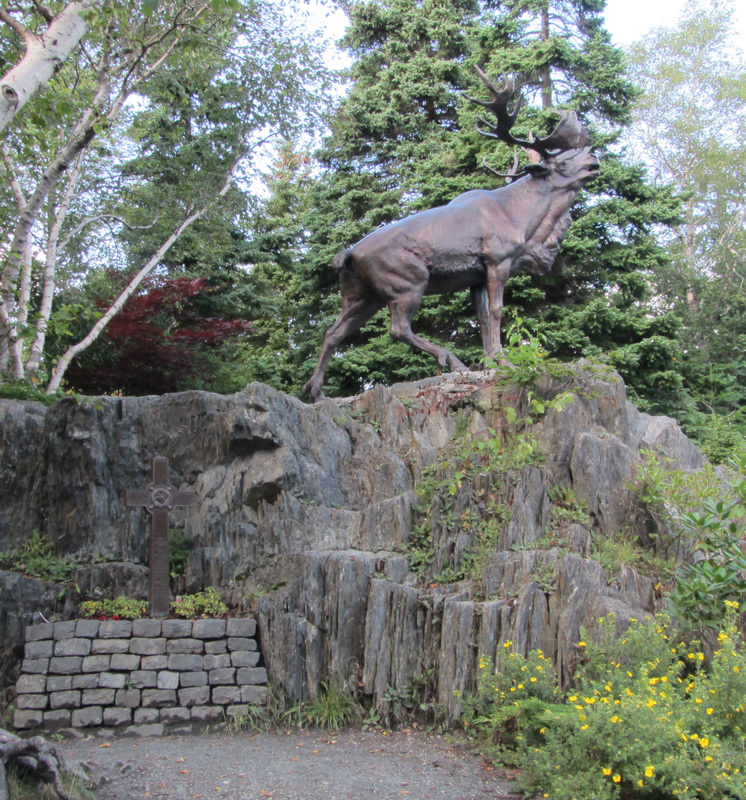 The Fighting Newfoundlander stands in Bowring Park, St. John’s, NL, as “A Tribute to the Undying Memory of the Royal Newfoundland Regiment 1914-1918.” British sculptor Captain Basil Gotto also sculpted the Caribou Monuments. Corporal Thomas Pitman posed for the statue. A survivor of the 1916 Battle of Beaumont-Hamel, Pitman received the Distinguished Conduct Medal (DCM) and the Military Medal (MM). The statue was unveiled in 1922. Scroll down in the history of Bowring Park for the story of how Pitman came to pose for the statue and the lifelike details that Gotto captured. Categories: Monuments and Memorials | Tags: Basil Grotto, Beaumont-Hamel, Front line, Newfoundland history, Newfoundland Regiment, St. John's, Western Front, WW1 memorials | Permalink. The caribou is the Royal Newfoundland Regiment’s emblem. Brass cross lists the regiment’s major battles. 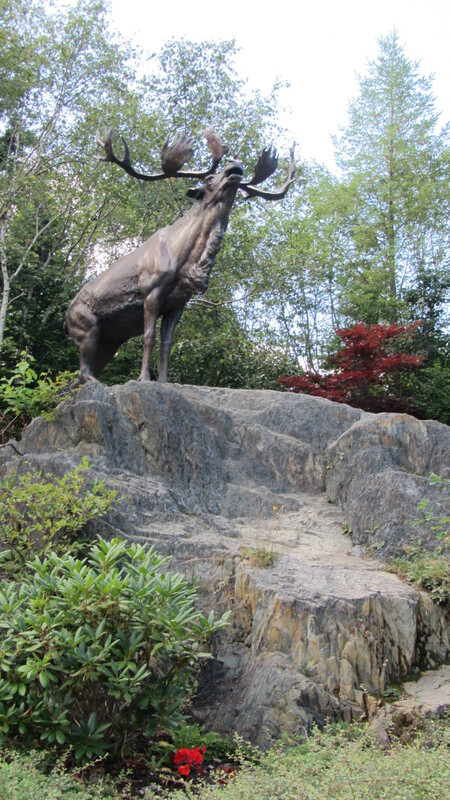 The Caribou Memorial in Bowring Park, St. John’s NL is one of six. The other five caribou mark sites in France and Belgium where the (now) Royal Newfoundland Regiment fought: Beaumont-Hamel; Gueudecourt; Masnières; Monchy-le-Preux and Courtrai (Kortrijk). The caribou is the emblem of the Regiment. 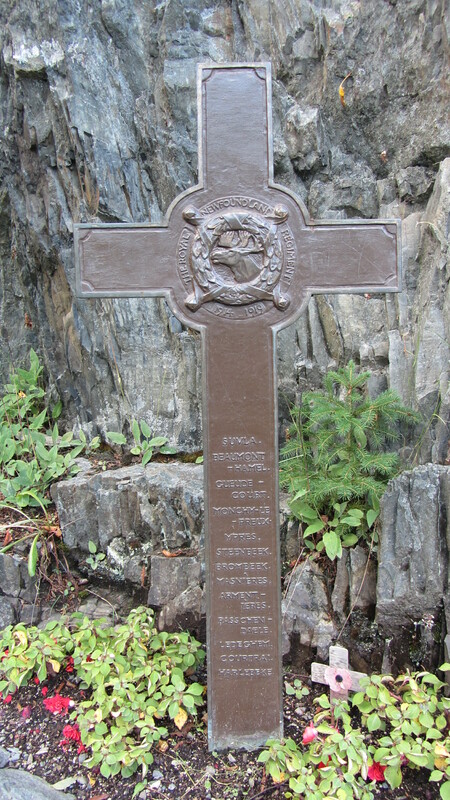 A brass cross below the St. John’s caribou lists the major arenas of the Regiment’s battles. Categories: Monuments and Memorials | Tags: Beaumont-Hamel, Newfoundland history, Newfoundland Regiment, St. John's, WW1 centenary, WW1 memorials | Permalink.